"This is an extremely important book, which presents a depth of understanding of estimating and scheduling rarely seen in industry. It explains the techniques used in a number of schedule analysis software packages, and encourages a more mature approach to understanding the information presented by a project schedule. It should be required reading for all project managers, schedulers, and risk practitioners; and also for programme managers, sponsors, and all staff involved in contracting for project delivery." "This is a well-documented and extensively illustrated text that takes novice and expert alike on a journey of discovering how to handle risk and uncertainty when they apply to project activity durations … By having each math exercise direct apply to examples of schedule management, we arrive at the added business value of increased certainty for project duration almost before we realize that it was those simulated 5,000 random iterations that got us there… Dealing with schedule risk requires serious attention. This serious volume addresses the subject in an intelligent and instructive manner." "The book being organized in eleven chapters give it a broad and in-depeth coverage of the subject matter...there are no new terminologies that could complicate or mis-represent applications...The book seeks to encourage and promote the need for project schedulers and project managers to develop practical as well as thorough competencies...Another impressive perspective is the inclusion of a novel way to take account of risks in schedule risk analaysis models called 'Risk Driver' method being a powerful way mapping risks to activities...The book provides an interesting read." Project scheduling is required for good project management, and the schedule represents the project plan under a specific set of assumptions, often that it will avoid new risks or even those that have occurred on previous occasions. The typical Critical Path Method (CPM) schedule assumes that the project team knows how long the scheduled activities will take. Yet, the experienced project manager knows that duration values so precisely stated are actually only estimates based on assumptions that could be wrong. A schedule risk analysis explores the implications for the project's schedule of risk to the activity durations and also identifies the most important schedule risks. This analysis, building on and extending CPM scheduling, will result in a more accurate estimate of completion and provide an early opportunity for planning effective risk mitigation actions. Why is the duration uncertain? How do we represent this uncertainty with a probability distribution? How does uncertainty of activities along a path lead to more uncertainty of the path's completion date? How can a schedule with parallel paths be riskier than each of the paths individually? How can we represent risks about activities that are not in the schedule at all? Culminating in a discussion of the most powerful and advanced capabilities available in current commercial software. Schedule risk analysis is a process that is industry-independent, and the methods explained in this volume have been used by the author with positive effect in such industries as construction, oil and gas, information systems, environmental restoration and aerospace/defense. The result is a book that is not only highly practical; something that people within all types of projects and in all industries can apply themselves; but that is an extraordinarily complete guide to creating and managing a rigorous project schedule. 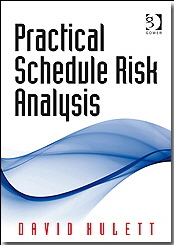 Preface; Why schedule risk analysis? Looking beyond the critical path method; Uncertainty in activity durations: using probability distributions; Uncertainty along a schedule path: using Monte Carlo simulation; A good project schedule is needed: Critical Path Method scheduling 101; Collecting risk data: exploring methods and problems; Where parallel paths merge: introducing the 'merge bias' and risk criticality; Probabilistic branching: analyzing discrete risk events; Using risks to drive the analysis and prioritize risks: introducing the 'risk driver' method; Schedule contingency plans: using conditional branching; When activity durations move together: incorporating correlation; Risk management in the organization: identifying the mature risk management culture; Appendix: the problem with PERT; Index. David T. Hulett is internationally recognised as a leading expert in risk management, leader in risk management activities of the Project Management Institute (project manager of the Risk Management chapter of the PMBOK® Guide, 2000 and 3rd editions), deputy PM of the Practice Standard for Project Risk Management (ongoing), core committee member for the Practice Standard for Project Scheduling and frequent conference speaker. He has a consulting and training practice with clients in many industries around the world.